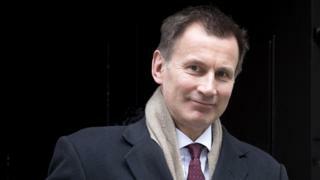 Jeremy Hunt has apologised for not declaring his interest in a property company set up to buy luxury flats. The health secretary has a 50% interest in the firm – set up with his wife in October – but he did not declare it to Companies House until six months later. His spokesman said it was an “honest administrative mistake”. The Telegraph said Mr Hunt set up Mare Pond Properties in 2017 to buy seven flats in the Ocean Village development in Southampton. The minister did inform the Cabinet Office of his involvement with the company after it was set up, he added. The department has since said there was no breach of ministerial code. A Downing Street spokesman said it was right that the minister had apologised for the “administrative oversight”, but agreed with the Cabinet Office that there was no breach of the ministerial code. “We consider the matter closed,” he added.